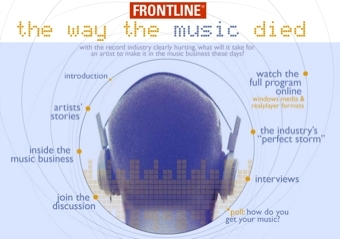 Frontline, the flagship documentary program for the PBS televsion channel, took a critical look at the music industry last week in a program called "The Way the Music Died." You can watch the program on their website if you missed it. I thought the documentary had a lot of problems (myths, innacuracies, and an unjustifiably pessimistic take on the contemporary music scene), but the website is great and I fully recommend exploring it. It's got loads of links to some of the most interesting music industry journalism over the last few years.